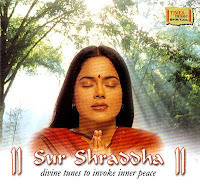 In Sur Shraddha we continue to explore and celebrate the Divine through popular devotional compositions, mostly from Indian films to soothe and caress your inner soul. An album that will appeal to your soul. Words that uplift you from the realm of the normal, melodies that originates from deep within. It is a sublime rendition of our prayers and music, Shraddha. Meaning, devotion, meaning sixty soothing minutes for your soul. Shraddha is a blessing, in the guise of a musical album.